Rich's painting ONCE UPON A TIME is included in the book along with the work of 130 internationally known artists. 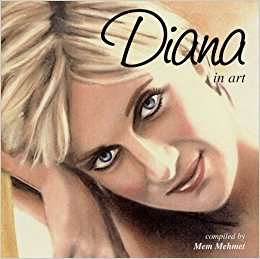 "Never less than riveting, we thought we would bring to your attention these exquisite works of art taken from DIANA IN ART, quite frankly one of the most must-have coffee table books of the millennium." "Born Diana Frances Spencer July 1, 1961, Lady 'Di' married HRH Charles Prince of Wales on July 29, 1981. It seemed to millions around the world to be the kind of pairing only read about in fairy tales. Soon, two sons, Princes William and Harry were born and all seemed well at first. But, over the years, the pressures of life - and such a public one, open to constant and intrusive scrutiny - and certain personal shortcomings were to prove their undoing. The 'ideal' royal couple finally succumbed to the sort of marital problems faced by many modern couples and Diana and Charles were divorced in the inevitable glare of ongoing publicity. Then, just as Diana seemed to be building a new life, she died as the result of a tragic car crash on August 31, 1997. My interest in the Royal Family goes back to my childhood. My paternal grandmother was a monarchist, and, in our house, the Royal Family was a topic of ongoing interest. In 1953, my Mother created a scrapbook for me, recording the June 2 coronation of HRM Queen Elizabeth II. I was 7 years old. Because Prince Charles is nearly my age, he became the Royal with whom I could most easily identify. 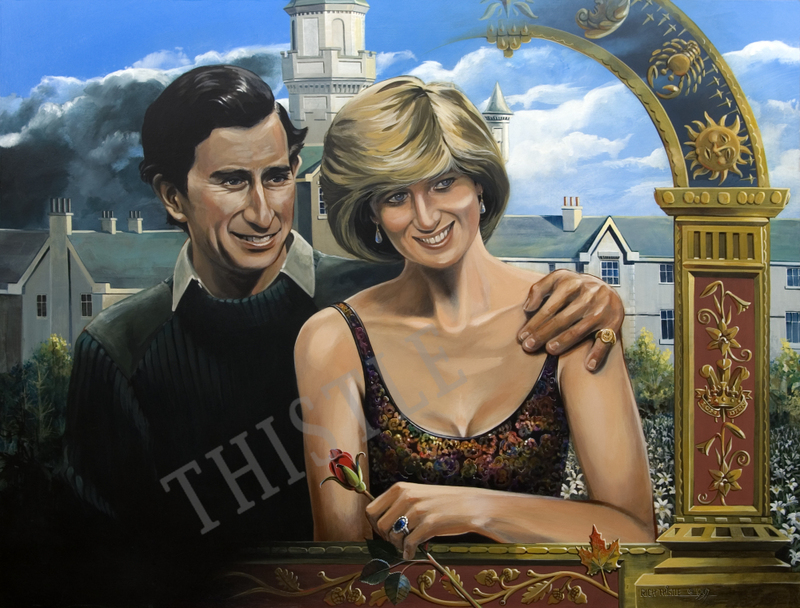 So, when Charles and Diana announced their plans to marry, I was moved to give them a personal wedding gift. Through the Canadian Governor General's office, I sent them a large framed drawing which had been exhibited as part of my first solo exhibition in 1980. Some of the large graphite works in that show portrayed royalty. The particular drawing I gifted to them called WALKING TO WORK, depicted Charles' great uncle, Edward VIII in a moment of royal rebellion, choosing to walk to Buckingham Palace rather than chauffer driven. Immediately after this exhibition and following the announcement of the royal engagement, I began a new work which was meant to celebrate the "story book" union. It was to be a double portrait of the happy couple. I finished a full-scale working drawing, but for some reason it got rolled up and put away. That was in 1981. Several times over the intervening years I looked at it and considered completing the work, but for some reason, I was never motivated to do so. Then came the sudden death of Diana in 1997. I immediately thought of this drawing and made a decision to complete it as a painting and as a tribute to her. It would be my way of dealing with the shock and sadness. In the original working drawing, Charles was actually the dominant figure, and, as in many of their engagement pictures, he seemed much taller than she, although he wasn't. I decided that I would update Diana's portrait making her the significant element in the painting, with a clearer reference to the celebrated, more mature person she had become over the years. Using the same familiar pose as seen in many of the engagement photos, but depicting a more adult Diana was important to the content I wished to express: that note of friction and tension which came to dominate their relationship. At the same time, I wished to capture her vulnerability in this relationship as well as her trademark demure countenance, the head-down, peaking-beneath-the-bangs expression which had helped to endear 'shy Di' to millions around the world. I chose to depict Charles in a very casual military sweater, but to represent Diana as a glamorous figure wearing a gown, making reference to her famous wardrobe of designer evening wear. Rather than choose one of her actual dresses, I "designed" one for her, a sort of gown of many (iridescent) colors. For me, this contrast of clothing speaks of two very different people. In the background is a "castle" based on elements of Balmoral, which, over the years, Diana had grown to detest. I surrounded the castle not with expansive lawns but with an impenetrable barrier of tangled brush, reminiscent of the castle where Sleeping Beauty lay waiting for her prince. Behind the figure of Diana is a field of lilies, (her favorite flower) a reference to the acres of flowers which were deposited by her mourners during that unprecedented phenomenon of mass public grief following her death. The decorative Renaissance "arch" element, which I find reminiscent of a puppet theatre stage, relates to the longevity of the institution of British royalty and carries symbolic decoration, including the Prince of Wales' three-feathers-and-crown coat of arms, lilies to represent Diana, English oak leaves and acorns and suggestions of the heavens and astrology, including Diana's sign, Cancer. Diana holds in her hand a red rosebud, signifying youth and beauty, a life just begun, and an obvious reference to her as the "Rose of England". The thorns of the rose warn of pain that often accompanies beauty. And, among the oak leaves in the decorative arch, is a single maple leaf in autumn color identifying the work as one Canadian's tribute to Diana, whom we all claimed as our Princess too. Her engagement ring, prominently displayed, symbolizes a promise made but never kept. His ring suggests that, although he can easily portray the common man in casual clothes on his country estate, he will always be a Prince, the King in waiting. His rather large hand on her shoulder ominously signifies the power and control the Royal Family held over all aspects of Diana's entire adult life. Some may question my inclusion of Charles in a tribute to Diana. I suppose now, because I somehow identify with him, I feel betrayed on a certain level by his failures as an 'ideal' husband and role model for my generation. However as the father of Diana's two sons and an important part of their lives, particularly now and in the future, I decided he had to play a significant role it this painting. Perhaps for me, including Charles is a symbol of hope that he will succeed as a father - and a king - where he failed as a husband. After all it was only through her relationship to Charles that Diana would become world famous and so greatly admired. Without him, she may well have lived out her life in relative obscurity rather than as a larger-than-life world figure, the "Princess of Hearts". I am very pleased to have my painting represented in Mem,Mehmet's book DIANA IN ART. Obviously many other artists have been similarly moved by this short but momentous life."